DHANGADHI, Jan 15: Three Star Club has advanced into the semifinals of the ongoing International Invitational Khaptad Gold Cup football tournament defeating Chyasal Youth Club 1-0 in Dhangadhi on Monday. 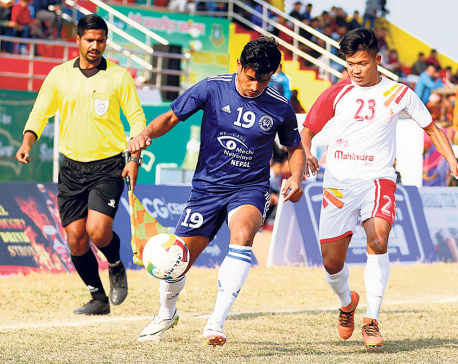 In a highly-competitive third quarterfinal match of the tournament, Three Star’s Rupesh KC scored with three minutes from time taking advantage of a lack of combination between the Chyasal defense line and goalkeeper. Chyasal kept Three Star under pressure throughout the game, but missed many chances in front of the goal. It had missed three easy chances to score, and later lost the game because of the defense mishap. Three Star also got some chances in the game, but it could not score too. 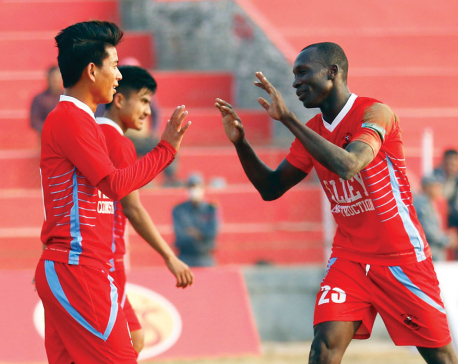 Fode Fofana hit a shot after a pass from Sunil Bal, but the shot was punched away to safety in the third minute by Chyasal goalkeeper Dinesh Thapa Magar. Chyasal’s Hemant Thapa Magar hit a free-kick, but the set piece hit the cross bar in the 19th minute. Three Star’s Bal hit a shot from outside the penalty box and his shot hit underside of the bar, but did not cross the goalline in the 28th minute. Ananta Tamang hit a strong shot from 25 yards out in the 39th minute, but the ball was easily dealt with by Chyasal keeper Magar. As both the teams could not convert the chances they created, the first half ended goalless. Chyasal missed a glorious chance in the 58th minute as Armand’s shot was blocked by Three Star’s Tamang, and the rebound shot went wide of the target. Three Star’s Ranjan Bista hit a brilliant volley, but the ball sailed over the bar in the 81st minute. KC scored the winning goal three minutes from time and did not give Chyasal any chance to come back in the game. Bal provided a cross inside the box looking for KC. His header was saved by keeper Magar. But, as the defense could not clear the ball, KC struck the ball again and it went in. KC was named the man of the match and was rewarded with Rs 10,000. Three Star coach Ujjwal Manandhar said that the win against Chyasal was possible because of the hard work from the players. “We won the match as the players worked really hard in the game,” Manandhar said. Chyasal head coach Raju Shakya said that despite playing well, his team could not win. “The players performed hard throughout the game, but we could not score. In the last moment, the lack of combination between the defensive line and the goalkeeper cost us the game,” Shakya said. Three Star will now take on Mechi Netralaya Kakarbhitta Football Training Center in the semifinal on Wednesday. The last quarterfinal match will see Sankata Club and Cameroon’s Dauphins Club take on each other on Tuesday.